This could get interesting for air travel in Europe if winds are in the right direction. Absolutely. It could also seal the fate of the Arctic Sea Ice, if not this year then possibly in the coming years, with all that extra ash landing on the MYI. Icelandic Met Office has moved the warning level for air traffic up to Orange level (see here). GPS measurement have confirmed magma movements inside Bárðarbunga volcano and this movement is fast. I don't expect a whole lot to come out of this, climatically. The biggest known eruption of Bárðarbunga, a VEI 6 in 1477, did not loft a whole lot into the stratosphere (nor did the 1783 Laki plume), though it did leave small peaks of nss sulfate (non sea salt) in ice cores on both poles. A baby volcano will be born! LOL. Maybe one called 'Litle–Kverkar' (Little Strangler). Gotta love Iceland. Yr today uploads this map of the potential ash cloud over Northern Europe if Bardar erupts today (Aug 21). Lots of debate on this happening over at Volcano Cafe http://volcanocafe.wordpress.com/ with daily updates and discussion. Looks to be fairly well balanced even if most of it goes right over my head! In the Bárðarbunga caldera, where it all started, earthquakes still occur; probably because of slight subsidence due to the outward flow of magma from the magma-chamber under the caldera." Guess they wouldn't be 'officials' much longer if they thought otherwise, eh? These are quotes from the volcanologists not politicians, and earthquake storms do die out without their being eruptions. They are waking a fine line between needless worry and being overly cautious. shouting the end is nigh at every shake is counterproductive (especially in Iceland that has minor quakes all time). Evacuations have been ordered nearby in case there is an eruption but there is no guarantee there will be one. Volcanos can shake for weeks before an eruption, which may or may not surface. When if it does it may be a minor eruption. All known & understood long ago. I still trust Jón in Copenhagen more than anyone in this case. His word is more credible than officials who fear a muslim invasion of Iceland (the official reason we patrol the area with Norwegian jet fighters). Yes indeed, can't hyperventilate for months on end and expect anyone to still be listening. One time I rushed over to the Big Island for the once-in-a-lifetime view of Kilauea -- turned out, any time during the subsequent 31 years worked. At Pu'u 'Ō'ō our nanny govt had put up a warning barrier but I continued on until the soles of my shoes melted (on the thin roof of an unmarked lava tunnel). Two hikers were killed while I was out -- passed out in a gas pocket, fell back in. "There are no measurements to suggest that an eruption is imminent. Previous intrusion events in Iceland have lasted for several days or weeks, often not resulting in an eruption. However an eruption of Bárðarbunga cannot presently be excluded, hence the intense monitoring and preparation efforts. Intense earthquake activity continues at the Bárðarbunga volcano – a situation that has persisted since 16 August. "There are no signs that the seismicity is decreasing. A 25 km long dyke has formed in the crust under the Dyngjujökull glacier at 5-10 km depth. Interpretation of the latest data suggests that the magma continues to move along the dyke, possibly branching at the northeast end of the dyke. "One earthquake of magnitude 4.7 was measured in the Bárðarbunga caldera at 4 km depth yesterday evening at 23:50. This large event was at similar location as earthquakes of magnitude larger than three that were seen yesterday. Large events in Bárðarbunga are interpreted as adjustments of the caldera rim related to decompression in the caldera since the beginning of the unrest. The activity continues and an eruption can therefore not be ruled out. "There are no signs of increased conductivity through geothermal activity into the rivers. From the beginning of the activity, measurements done with GPS have shown displacements on the surface of over 14 cm, 15 - 20 km from Dyngjuháls. In comparison, Iceland on the whole is spreading at the rate of about 2 cm/ year. 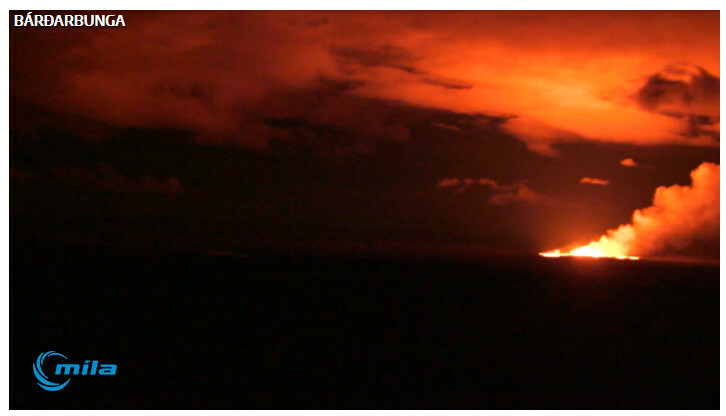 The Bárðarbunga web cams could get interesting. Right now, they are not. In terms of relevance to Arctic climate change, I would rate a major global cooling event, jökulhlaups under Greenland or albedo darkening of sea ice/Greenland at 0 on a 1 to 10 scale based on the 125,000 year NEEM core record. Although ... there has been recent explosive rifting under the Arctic Ocean at Gakkel Ridge, sudden meltlake draining is vaguely reminiscent of a jökulhlaup, and albedo from something is getting worse. I'd still put the odds of a Barðarbunga eruption as better than those of an Islamic invasion of Iceland in late August 2014. Here's a pretty neat picture, at least. «Furthermore, volcanic eruptions can have a long-term effect on climate, producing either warming or cooling effects. Aviation Colour Code Red has been declared for the Volcano Bárdarbunga and the surrounding area. Icelandic Met Office helicopter observation confirms ongoing eruption that appears to be small at this time. Keep up with the updates as they come. RED: Eruption is imminent or in progress - significant emission of ash into atmosphere likely. Update from the Icelandic Met Office. Zoom in on Vatnajökull to see the currently interesting volcano names. Now traveling to nearby volcano, out from under the glacier. These guys predicting it could be a major event 100km3 of lava and a major rift. If it is a major event and longlasting, I expect to see huge heaps of ash landing on the Arctic Sea Ice as it settles and refreezes this autumn. This way Bárðarbunga can play a major role in the emptying of the basin for summer sea ice. Who expected that at the beginning of this melt season?! Right now, the second most optimistic end for this is regular volcano in less than a week. If the rift actually opens, there have been quakes all the way down to the mantle. The quakes have now moved NNW also, further up the Mid Atlantic Ridge. They also appear to have tied into multiple paths to nearby existing volcanic areas. One of the areas starting to shake is the hydro dam at north edge of glacier..... There are 2 of them up there. There will be more to worry about than ash. This dyke is going to erupt in my view, it is just a matter of time now. It might not erupt, that is always a possibility. I just think it is highly unlikely to be the outcome of all of this. This dyke is going to continue making a path for it self until it hits a resistance in the crust it cannot break after that it is going to go up, since its easier path for it, rather then to go down into the crust where its path has more resistance. Another larger quake today a bit away from Bardarbunga to the direction of Askja. This one was 3 km shallower than that of three days ago. Could it be the main event will be outside known calderas, forming a new vent for Kverkfjöll? As the area is known for fissure eruptions there would be several vents but this 3 km's up in three days would give it about a week until lava. I'll give it two, then forget about it, then get surprised when the ash gets here. The arrow is for the fissure quakes, indicating moving lava. I've been following this pretty closely now for couple of days. After a couple of ~+5 quakes last night, one near Askja, one near Bardarbunga, smaller tremors have nearly ended. Is the Askja system a safety valve or will it join in to fill in the voids left by the quakes? Nobody seems to know. Some talk of the quakes being in some sort of synchronicity, I'll guess couple more days to see if the quakes lowered the threat of an eruption or has the system enough energy to produce an eruption. No guesses on how large an eruption would be, officially IMO (Iceland Meterological Office) are talking only of smaller eruptions. I've been following this pretty closely now for couple of days. After a couple of ~+5 quakes last night, one near Askja, one near Bardarbunga, smaller tremors have nearly ended. We do seem to be down to about 3 an hour over M2 since about 07:00 on 27th. However a comment somewhere suggested that more smaller quakes might be posted after data is reviewed. Does that make drawing conclusions on a slow down rather dodgy? Perhaps make a few copies of this table summary? Been looking @ http://hraun.vedur.is/ja/drumplot/IDYN.png , yesterday was much more active. Maybe it'll pick up. I'm not hazarding a guess about when. now there's an M3 and M4 with some glacier cracking (good morning, BTW) , people guessing glacier's melting underneath, the above glacier dropping down -> crevasses 15m deep and several kilmometers long E of Bardarbunga. Cauldrons have formed in Vatnajökull glacier just SE and SSE of Bárðarbunga volcano. The cauldrons that have been spotted today in Vatnajökull just SE and SSE of Bárðarbunga volcano are in the south end are of the current dyke. What is also important, they are also in an area were magnitude 5,0 earthquake did happen few days ago, in a area that has not had any dyke activity since 16-August-2014 when this all started. It is still unclear what happened to all the water in this melt, the glacier in this area is 400 to 600 meters thick and this is not a little melt that has taken place in the glacier. There is a chance the water did go to Grímsvötns lake (caldera like in Grímsfjall volcano), but that remains unclear at the moment. yes, circular they are, cauldrons in ice. Reconnaissance flight later in the morning, partly to find out where the meltwater might have gone. Another (I guess) M2-3 quake recorded some 45min ago but it's off the main event, I'd say to the west-northwest, so I guess it's not directly related to the magma intrusion developing NE-wards. (update:) ~M4 quake @ Askja about 07:45 local time. ; 08:14 a biggie, possibly M5 somewhere near the beginning of magma intrusion aka dyke in the fissure zone (W or WNW of Kverkfjöll, if my eyes and reasoning are ok ;-) ), with longlasting tremors afterwards. Something definitely broke in this one, whether it was the surface crust or deeper quake, no knowledge yet. When I have looked since posting previous 2295, it has been just above 2300. Now up to 2485 but more up to M2 and less above. Cambridge team on the ground installing new sensors. Possible video of magma surfacing at Bárðarbunga. Edit: I should say somewhere around Bárðarbunga, the video is lacking in points of reference. Official: WarningA fissure eruption has started north of Dynjujökull. Jón says: Eruption has started in the dyke area. The eruption appears clearly on Míla web camera. It can be viewed here. The magma has now breached the surface and the volcanic eruption has been confirmed by scientists in the field. The low frequency tremors suggests the eruption is located outside the glacier. The blaze can be observed in Mila’s webcameras, two of which are trained on Vatnajökull glacier’s Bárðarbunga area. According to the National Commissioner of the Icelandic Police the eruption is thought to be coming from a 3-400m long fissure with direction to NE-SW according to first reports. Of course it starts when I'm sleeping. occasional glances for 16 hours/day for three days. A couple of openings in between Bardarbunga and Askja. Tremors have continued, it looks like, all the way in the dyke zone between those two, so I think there's more to come, and a fissure eruption like the 1970s one maybe on it's way. Neven was again a prophet on this, the eruption is outside calderas . More seriously, fissure eruptions are pretty common in Iceland, and usually do not produce a baby volcano for the lava flowing out is so runny, but let's see. Bardarbunga birthed a side crater if you want to continue with the parable . The eruption is currently not under glacier so only minimum harm to air traffic is expected, flight restriction zones may change in a flight, though. There is (of course) a huge traffic load to icelandic sites, so webcams and Iceland met office sites are occasionally down, is the 'livestream' recommennended by people at volcanocafe. Civil protection officials said Icelandic Air Traffic Control had closed the airspace above the eruption up to a height of 18,000ft (5,500m). The fissure eruption took place between Dyngjujokull Glacier and the Askja caldera, a statement from the Department of Civil Protection said. The area is part of the Bardabunga system. "Scientists who have been at work close to the eruption monitor the event at a safe distance," the statement added. "The Icelandic Met Office has raised the aviation colour code over the eruption site to red." It added that no volcanic ash had so far been detected but a coast guard aircraft was due to take off later to survey the site. Warning: Fissure eruption in Holuhraun (north of Vatnajökull). Lava flowing at a 1000 m³ / sec. The webcam is a long way away. The lava fountains are up to 60 meters high and the fissure is more than a kilometre long. Awesome, terrifying and stunningly beautiful at the same time!